If you are looking for a tracking only device to monitor and track your four legged friends then search no more. Garmin’s T5 has in internal GPS/Glonass receiver that tracks in the harshest conditions and won’t let you or them down. This collar top mounted device tracks up to 9 miles away keeping you in synch to their whereabouts even under heavy canopy. Venturing out for some night hunting? LED Beacon lights activated from the Astro 320, or Alpha 100 are visible within 100 yards, easing keeping up with your dog’s whereabouts when the sun goes down. And, the T5 Device is water resistant to 10 meters, so an unexpected diversion through a stream is never an issue. The T5’s lithium battery stays strong between 24-48 hours, and is rechargeable. Strap a T5 on your dog and see what outdoor adventures await you. 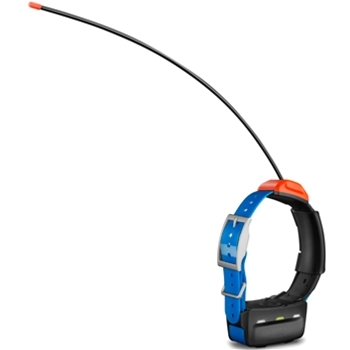 Each Garmin T5 comes with:T 5 dog device with rechargeable lithium-ion battery, 1-inch blue collar strap, Charging clip, AC adapter, Vehicle power cable, Manual and a One-Year Warranty.